Russell Westbrook becomes the first Jordan Brand athlete since Michael Jordan in 1998 to win the MVP award. To honor Westbrook, the brand releases a commemorative “Why Not 0?” spot and a limited Air Jordan XXX1 Russell Westbrook shoe. The spot underscores one of the greatest individual seasons of all time and reaffirms that although zero is the number Westbrook wears on his back, it no longer represents how many MVP trophies he has. 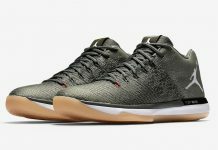 Celebratory Air Jordan XXX1 “Russell Westbrook” shoes are now available on Nike SNKRS. “Why Not 0?” tees can also be purchased on Jordan.com.